Jose Soberano III, who steered his homegrown business Cebu Landmasters, Inc. to an initial public offering (IPO) earlier this year, was picked Entrepreneur of the Year during the 2017 Grand Chamber Awards. Soberano received the award from the Cebu Chamber of Commerce and Industry (CCCI) during the Grand Chamber Awards and Fellowship Night last June 30 at Marco Polo Plaza Cebu. The awards night capped the Cebu Business Month 2017 celebration. Soberano, chairman and chief executive officer of Cebu Landmasters, Inc., left Ayala Land in 2000 to build what is now the top local housing developer in Metro Cebu. 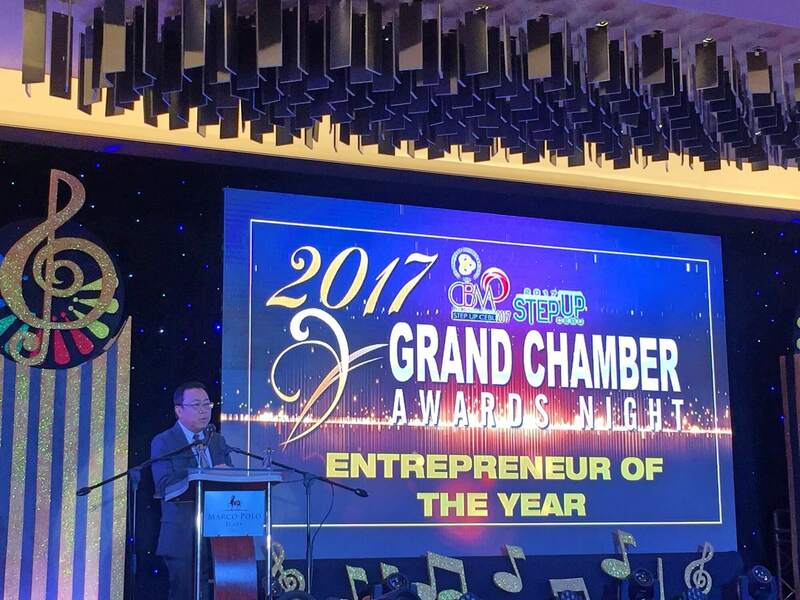 Jose Soberano III speaks during his awarding as the Entrepreneur of the Year during the 2017 Grand Chamber Awards. The Entrepreneur of the Year is the most prestigious among the five awards bestowed by the chamber. The other awards are Corporate Social Responsibility Institution, Small Business Entrepreneur, Countryside Entrepreneur, and Young Entrepreneur. The awardees are chosen by the CCCI board of trustees and past presidents. CCCI President Melanie Ng said Soberano distinguished himself as the only Cebuano entrepreneur to bring his company public. Soberano announced earlier this year a P12 billion expansion in the Visayas and Mindanao to address the need for housing, offices, and commercial spaces. CLI has simultaneous development projects in Cebu, Bacolod, Dumaguete, Cagayan de Oro, and Davao for 2017.